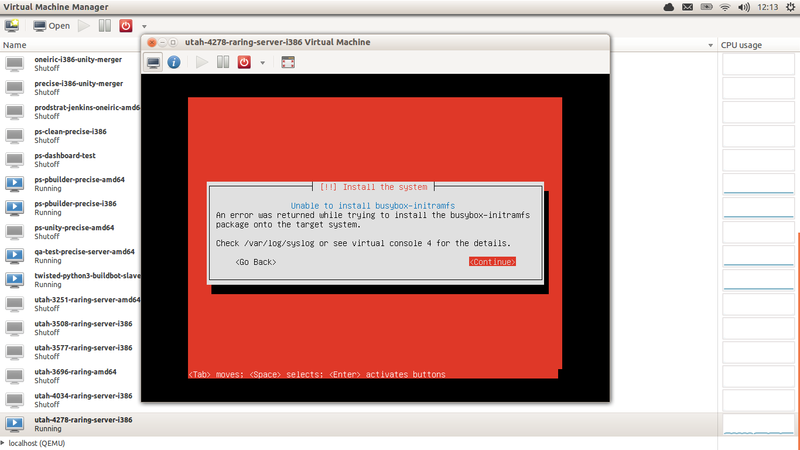 Raring virtual-host server preseeded installation failed with the following error with 20130206 i386 image. Feb 6 09:23:05 base-installer: 'chroot /target ...' instead. This appears to be an intermittent issue because a manual installation and a consecutive preseeded installation succeeded. I experience this issue too. I have 3 drives in the machine and have tried installing using the 12.10 server image and the 13.04 beta2 image. Same result on a core 2 IBM machine. It just won't install past "installing the system." This may be due to the fact that linux-server is a transitional package and now points to linux-generic. Perhaps if you were to use that package in your preseed you'd have better luck. Could you give this a try? Thanks in advance. @Matthew - unless you are using the same preseed file as the reporter of this bug you are unlikely to be experiencing the same issue and should open a new bug report. I'm having exactly the same problem with 13.04 64-bit server. Can someone elaborate on what's involved in using the linux-server package in the preseed? Thanks! So, I ended up in a menu which allowed me to test the bootable USB stick I was trying to use to install 13.04 AMD server, and it reported errors. I downloaded another copy of the 13.04 ISO and made another bootable USB. This one allowed the system to be installed with no problems whatsoever, so maybe my problem was just a bad bootable image. I created the first one with Startup Disk Creator on 12.04 Desktop, and made the second bootable USB using the Pen Drive USB installer on Windows XP. Same issue: 13.04 64-bit, ubuntu server. ...which makes me wonder what he did that actually solved it. pgoetz - did you do anything else differently? Did you choose the same boot line from the grub menu? The preseed (default set of auto-answers to the installer's questions, which is in the grub boot options of the kernel boot line) is /cdrom/preeed/ubuntu-server.seed for the "Install Ubuntu Server" choice I've been trying. I burned a CD (of the same .iso image) and the installation worked fine. I wonder if there are race conditions in the installer that are only triggered by the speed of the flash-based install? I just ran into this same problem, trying to install 13.04 amd64 server to raid10 root with 4 disks from a usb stick created with usb-creator-kde on kubuntu 13.04 desktop. Verification of the "CD-ROM disc" from the menu fails for the usb stick, but this seems to be bogus. which are all symlinks, vfat on usb does not support those. Just to doubly sure I copied the symlink targets in place of the symlinks on the usb stick, after which the integrity check passed ok. It does not affect the installation though, still fails as described in the original report. MD5 checksum is another (annoying and ignored) error. See http://askubuntu.com/questions/180218/why-does-integrity-check-fail-for-the-12-04-1-alternate-iso. Also seeing this on 13.10 server install. Has any progress been made, or is there a work around for this bug yet? I am seeing this on a 13.10 serer install with UEFI bios. I am installing onto a RAID1 mirror of two intel SSDs. The "copying files" step appears successful but whatever apt commands get run in the target by the installer seem to fail. Apt and dpkg commands run in chroot by hand seem to work. One thing to note is that /target/dev does not contain the md device that I am trying to install into. I think I saw errors on console 4 indicating that the raid devices (there are others not involved in the install) could not be accessed due to being busy. The md devices are present in /dev. * Perform a find / -name '*.REAL' in the target filesystem. Use these real versions of various executables to overwrite the fake versions. Examples include start-stop-daemon and initctl. * I actually wanted a desktop install so I installed ubuntu-desktop. Along the way I had to delete some stale symlinks and run a debconf fix perl script to get packages to install correctly. * I had to install the top-level linux metapackage to get my kernel intalled and install the grub2 package to get it booting. This happens to me, too, server installation is currently broken in some settings. This appears to be a bug or a race in the installer logic, as running the apt-get command by hand in a chroot succeeded. So apparently there is not really an error during the underlying package installation, just the installer got confused. As a workaround I have installed 12.04 server (which installed just fine), and then upgraded to 14.04. Not pretty, but at least that worked. I'm seeing this too, Ubuntu 14.04 server install on a USB3 key to a 4.4GHz machine. I agree that it looks like a race. Then just go through the install as normal. Was failing 100% of the time before this change, works after it. Doesn't look like there are any negative consequences to the installed system. 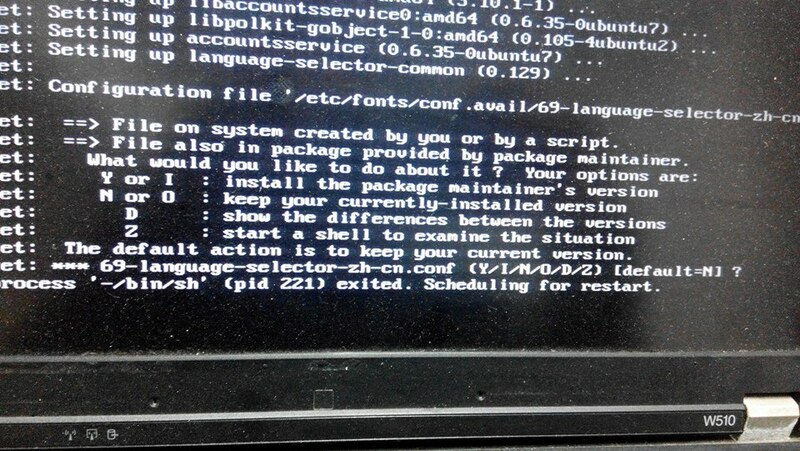 Also seeing this on 14.04 while using a usb key to install (only a cheap slow usb2 one though). Chris Ball's workaround worked for me though I was almost sick at having to do something this hacky. I saw this installing 14.04 using a usb thumb drive as well. As ugly as it is, Chris Ball's hack got me going. Actually I ran into further problems later down including install hanging due to files that needed to be clobbered and then not being able to boot properly. I went back and made the thumb drive image with rufus instead of unetbootin using the same ISO and this time it installed without issues and booted right up. This could be an issue with unetbootin. FWIW - I also had trouble with this on 14.04 LTS. Same here, I've tried 14.04 and 14.04.1 and both failed in a similar fashion. +1 for Chris Ball's hack, after a frustrating couple of hours of trying various things, this saved the day. Same here... Chris Ball saved the day. Unfortunately, Chris did not save MY say: I get the same message "unable to install busybox-initramfs" (same text in German). What is going on please? I did not find anything helpful elsewhere. Ran into this bug with the 14.04.1 x64 Server installer. Switched to a slower USB drive after reading this thread and was able to install without any issues. I've also seen this with 14.04.1; I tried Chris' workaround and the install gets further, but ultimately fails (probably for an unrelated reason). In any case, it is definitely still an issue. Actually I understood what was wrong in my installation!!! Basically I was reusing the same usb stick I used for a previous Ubuntu installation and the "Startup Disk Creator" application didn't cleared out the usb stick.. so files of two Ubuntu version (14.04 Desktop and Server) were coexisting causing this problem. Chris' workaround actually worked but in the end I had a server installation with gnome, cups, xorg and other desktop packages.. :( installation was compromised. When you say "Startup Disk Creator", do you mean usb-creator-gtk which is included with Ubuntu? Also met this issue in both ubuntu-14.04.1-server-amd64.iso and ubuntu-14.04-server-amd64.iso with USB stick to install. With the workaround from Chris Ball could bypass the issue, but the installor just hanged in another point as attached photo. Finally got it work with ubuntu-14.04-desktop-amd64.iso and used tasksel to remove desktop parts. I am seeing this in "Ubuntu-Server 14.10 "Utopic Unicorn" - Release amd64 (20141022.2)"
I will attach my syslog for full analysis. I am not using any preseed, other than the one that comes with the image, and this is from a USB stick created by usb-creator-kde on Kubuntu 14.04. Data point: the work-around in comment #22 worked for me too. Systems seems OK so far. Looks to me like this would be an issue caused by remaining files from other iso images when they are done using usb-creator. If you're running into the server install failing with such errors as "busybox-initramfs" failing to install or other messages saying that "apt-install or in-target are already in use"; see if you have a stray "casper" directory on the USB drive used to do the install. This would happen for people writing a desktop image to a USB drive, then writing a server image without formatting; the base installer will pick the squashfs file from casper/ first if it's there, which could make the installation fail. That may be, and I'll take a look, but when using usb-creator-kde (and I assume other versions as well), it formats the USB drive before it begins any copy process. usb-creator-kde doesn't actually format anything unless you specifically hit the Erase Disk button. Joshua, any results from your checking of whether you still have a casper directory containing filesystem.squashfs on the media you use to install a server? @Joshua, right, so you'd be seeing a different issue then. Is that generated image also failing to install completely? If so, which options do you choose in the installer? Do you preseed anything? I've opened a task for usb-creator since there does appear to be a case in which this is the source of issues -- when installing a desktop image first to a usb drive, then installing the server image to the same key without hitting "Erase disk", then the casper/ directory is left around and confuses the server install. It's assigned to me, that particular fix will be uploaded shortly. Hum, since it seems we may be talking about multiple different issues, I've filed a separate bug specifically for the usb-creator issues I was able to reproduce. That's now at bug 1450597. I don't remember my exact install options, but it wasn't a custom pre-seed. I don't have a system on which to test right now, but yes, I erased the disk every time before I created an install disk. Don't get me wrong, the workarounds listed are fine, but they shouldn't be required. Hi, there's someone in ubuntu-tw community can also reproduce this issue. Found the same issue with my HP Proliant ML150 G6 server. Thanks to Chris Ball's workaround as described in #22 I've past the point where the error occurred. Small acknowledgement that the workaround described in #22 works like a charm on a HP ProLiant G7 that's being setup with a USB stick. I have used Desktop image with the Startup Disk Creator first, then overwritten that with the Server image. Upon installing from such usb stick, the initramfs failed to install. Fixed this by formatting the USB stick and then only using the Server image. Thank you all for your helpful comments. I can confirm #38 (cyphermox) still applies to 14.04.04. Had a 14.04.04 desktop install and created a server install on the same stick without erasing it first. Ran into the "busybox-initramfs" failing to install issue as some others in this thread have.